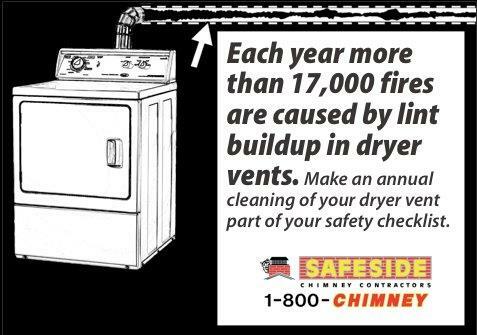 Keeping your Dryer Vent cleaned is a great way to extend the life of your Dryer and keep it your home safe. In most condominium complexes and town homes. All our technicians are fully trained in dealing with the variety of dryer vent configurations and can help you immediately. Call and schedule your Dryer Vent Cleaning today! Safeside Chimney & Duct Cleaning is one of CT’s leading Home service providers. Over the years, Safeside Chimney & Duct Cleaning has serviced thousands of satisfied customers on an annual basis. We currently service approximately 5000 + homes a year.